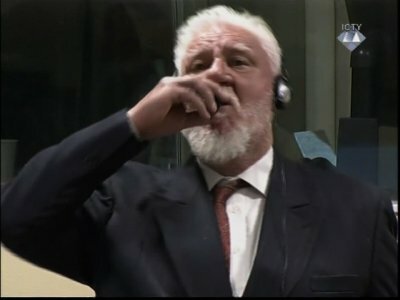 THE HAGUE, Netherlands (AP) — Seconds after a U.N. judge confirmed his 20-year war crimes sentence on Wednesday, former Bosnian Croat military commander Slobodan Praljak shouted, “I am not a war criminal!” threw back his head, drank liquid from a small bottle and told the court he had taken poison. A flustered judge halted the hearing and Praljak was rushed to a nearby hospital, where he died. Associated Press writers Dusan Stojanovic and Jovana Gec in Belgrade, Serbia; Sabina Niksic and Amer Cohadzic in Sarajevo, Bosnia; Eldar Emric in Mostar, Bosnia, and Darko Bandic in Zagreb, Croatia contributed to this report.